If you control 2 or more Warrior-Type monsters: You can Special Summon this card (from your hand). During your Main Phase: Gain 300 Life Points for each other monster you control. Once per turn, during either player's turn: You can negate the activation of an effect that targets a monster you control, and if you do, destroy it. When this card destroys a monster by battle: Your opponent takes damage equal to its Level or Rank x 200 points. If this card would be destroyed (either by battle or a card effect): You can pay 1000 Life Points instead. 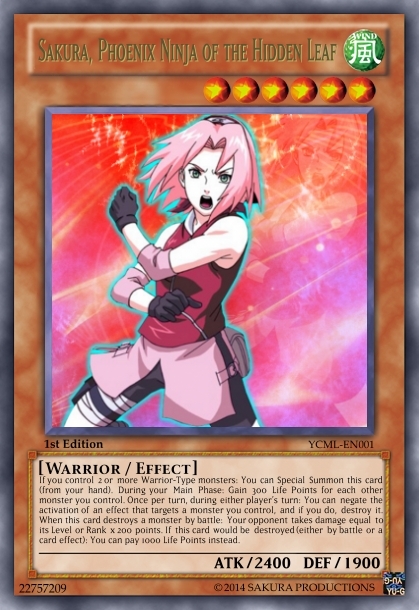 Yeah, this card is based on Sakura, the Naruto character whose name/pic I've been using around YCM (and elsewhere) since 2010. Anyway, effects represent Sakura in the anime/manga/game. SS effect references her role in the ongoing ninja war; added support for her friends if they're already out. LP recovery effect is a reference to her being a medical ninja. Burn effect reflects her super strength in the anime/manga. With that said, CnC/love/hate, etc. Reps will be given to those of you that provide good comments/CnC. Yeah, I had to balance this card's effects with her game abilities w/out inserting any pride references to me, since I do like Sakura. Well, there are several of them, however they're related to YCM. - Level is 6, which correlates to my user level here. Should factor in the recent chapter, but probably won't. I like how we seem to be the few remaining card makers that have perfected OCG, names, art, and even matching effects with their series. Help my dragons hatch and grow. Please.